Trusted by thousands of radiology residents, students, and clinicians, the "pink book" continues to be the perfect first book for essential, easily accessible information in skeletal imaging. 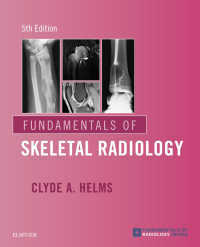 Fundamentals of Skeletal Radiology, 5th Edition, provides an authoritative introduction to x-rays, MR, and other skeletal imaging modalities, offering a quick, effective review of musculoskeletal imaging in a concise, easy-to-read style. Depicts musculoskeletal imaging concepts and techniques through hundreds of high-quality digital radiographs, MRIs, bone scans, and CT images. Uses a succinct, highly accessible writing style for easy, straightforward understanding of complex material. Updates include numerous new, high-quality MR images and extensive coverage of MRI of the spine and joints, including imaging protocols, common pathologies, and detailed specifics on reading and interpretation. Presents full-color imaging examples to help you discern subtleties and nuances for efficient and accurate interpretation. Discusses radiation dosage concerns, early detection, avoiding unnecessary exams, and common skeletal conditions, including a chapter on trauma.